I am very happy to be able to participate in December’s Sentence a Day link-ups. Rather than bore you with each of my sentences, in which some appear repetitive (all 31 of them for December), I am theming them and presenting some of them under each heading. I journaled each day using the phone app Write A Day so I could organize my thoughts and remember each day’s activities. At the bottom of the post is the link to visit other bloggers who shared their Sentence A Day posts. If you have followed my blog for a bit, you know I am enamored with my two dogs, Aero and Brodie. Having dogs can take up more time than one might imagine. We are used to traveling with them, they are not large dogs, but they still take up most of the back seat of my Toyota Rav4 with Aero’s booster safety seat and Brodie’s harness. Since we will leave for Hawaii from San Diego, I had to plan months ahead for where they were going to stay while we are gone. There are other dogs in both homes where we stayed. Navigating each dog owners’ preferences took some doing and coordinating. Last June, 6-month old Brodie bit my brother’s older dog’s ear in self-defense, so he was not keen on having Brodie stay at his house while we are in Hawaii. I worked it out so that Aero will stay with my brother and his two small dogs, and Brodie will be boarded at a nearby home doggie day care. This whole scenario caused me an amazing amount of anxiety because of the uncertainty with what to do with the dogs. At one point, I was ready to drive back to Sacramento and drop Brodie off at a friend’s house who has a female dog of the same breed. Now I’m convinced that Brodie will love hanging out with dogs his age and size and am finally at peace about it. It was hard to feel a bit unwelcome in my families’ homes because of Brodie. Fri Dec 1 So happy to restart the Sentence a Day challenge. My little dog Aero is not feeling well, so off to the vet we go! Turned out he was dehydrated and needed treatment. $250 later, the lab results were still inconclusive, but he bounced back. Sat Dec 2 Good times at the SPCA PUP Crawl also known as the #jinglebell walk event co-coordinated by one of my students! Spent the afternoon with my hubby, dogs, and a friend and his dog. Sun Dec 10 Brodie is one-year old today! Spent a relaxing Sunday writing and blogging. Tues Dec 12 Took both dogs to the vet early to have procedures done. I planned this during finals week since I didn’t have to be on campus. Brodie needed to be neutered (a dog license in my city for an “intact” male dog costs $300 a year, compared to $15 a year for pets that are spayed or neutered). While they were getting their services done, I met up with a fellow NorCal blogger today for coffee, Cathleen Townsend . Wed Dec 13 I stayed home today as planned while the dogs convalesced. Brodie was snipped and Aero had a teeth cleaning. Nice to get both done at once, but Brodie did NOT like the “cone of shame” and struggled for several days. I am very grateful for my family and happy they are all dog lovers, regardless of the logistics in traveling with our dogs. Tues Dec 5 Grades for one class done! Wed Dec 6 My last Wednesday morning class. I won’t miss the early 6am alarm or the traffic! Fri Dec 8 My last day teaching RPTA 100 (leisure Lifestyle development). I won’t miss the large class sizes (81 this semester) but I will miss the “aha” moments from students who finally get how important leisure is in their lives. Fri Dec 15 I am officially on vacation for the semester, having put in the final, official grades. In an interesting school-related note, tonight, Hubby and his friend went to watch our old high school football team (Helix High School) play in the CIF Section playoffs against a local Sacramento team. How cool is that? Helix lost 42 to Folsom HS 47, but it was a great game according to hubby. Mon Dec 18 Breakfast today with a fellow professor. We are both “retired annuitants” so we understand each other! Spent a good part of the day prepping the new spring class and feeling better about getting closer to being done! Made a list to be sure to bring all of my new class’ items to work on over the next three weeks while we are gone. I am very blessed to have this part-time lecturer position that supplements my pension. And I am grateful the Recreation, Parks and Tourism Administration department has faith in me as I continue teaching in my three-year contract. I am glad my boss sees the value that we “pracademics” (practitioners who now teach) can bring to the students going into the field of recreation and leisure. I’ve read many posts in December about how more folks are changing long-standing holiday traditions and/or simplifying their holidays. Because we inevitably travel away from home for the holidays, we have had to simplify certain functions. I mostly utilize online shopping which allows me to ship packages to where we stay, or shipped to me and wrapped there. I love decorating and usually start in early December, but with us being gone for as long as three weeks, I now decorate minimally—which means no tree most years. I got in the habit of using my photos for wallpaper/background for my computers and devices. I can carry my Christmas decorations with me wherever I go! Sun Dec 3 Beautiful, cold but sunny Sunday to be in church for the first day of Advent. Sat Dec 9 Spent the morning with hubby in retail therapy buying a smart TV and other tech gadgets. Oh, and a couple of Christmas gifts for others, too! Thur Dec 14 The frenzy begins as we prepare for travel and being gone for three weeks. Early start to a busy day…exercise, blog post prep, weigh-in, dog license, some last-minute shopping which included a Costco run! Whew! Sun Dec 17 A beautiful choir presentation at church for the third Sunday of Advent. Their version of “Mary, Did You Know?” left me weeping and I remember why I miss singing in the choir. Such a blessing! Tues Dec 19 My unofficial spa day as I continue to prep for the holidays—great workout, facial, then pedicure. Ahhh! Thur Dec 21 Packed, blog posted and ready for publishing. Now bring on the travel and the holidays! We leave tomorrow! Sun Dec 24 Karaoke singing on Christmas Eve is a new tradition we’ve enjoyed the last three years. Mon Dec 25 Merry Christmas from my brother’s house! We had brunch with the family while the kids threw paper around. The medical transport brought my mom over from the nursing home, so we could spend some quality time with her. Christmas Round two was spent with our combined adult children. Hubby cooked a wonderful tri-tip and it was nice to wind the busy day down quietly. 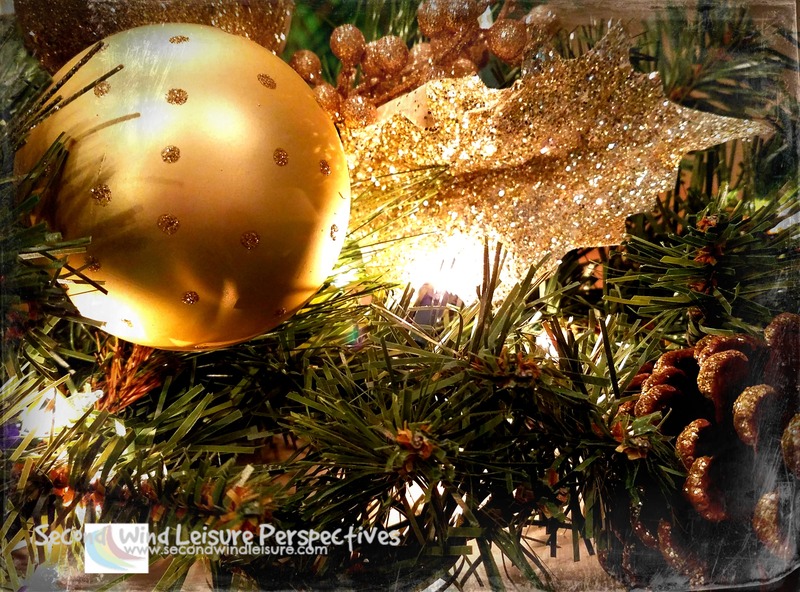 My hubby and I are content to share our time with our families, our adult children and their significant others, as well as simply enjoying each other’s’ company during Christmas. Thurs Dec 7 Weight Watchers changed their points system again calling it “Freestyle.” Seems like it might be better with more “free” foods like chicken breast, beans, corn and peas, things I love and normally eat! When I heard about this from a member I was ready to resist. Moral of the story? Attend meetings with an open mind! Tues Dec 26 Are you a “day-after-Christmas shopper” looking for hot deals? I used to wake up early to hit the malls, then decided I was over it, and like Black Friday, I now avoid the after-Christmas sales. That evening we all went to see the movie “Star Wars: The Last Jedi.” It did not disappoint. I watched the first Star Wars movie when it originally aired in 1977. Forty years of Star Wars, are you kidding me? Lots of nostalgia for both my hubby and me, as we recalled being in our senior year of high school (Helix reference again) when we saw the original. Wed Dec 27 Finally went to the gym to work off all these extra treats. We spent part of the afternoon on my oldest daughter’s last day (visiting from San Francisco Bay area) at the Ocean beach dog park. I am grateful for the fun and interesting times I have in my life, where leisure and other events balance out my days. 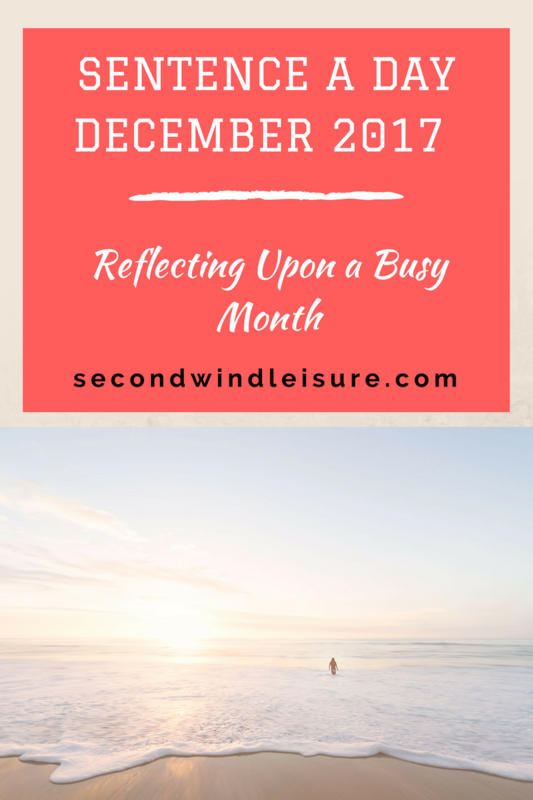 The month of December itself can be a whirlwind of activities amidst holiday planning and gatherings, and while we have come to expect the hub-bub, those exceptional events that pop up make for even more lasting memories. As I mentioned earlier, we always travel for Christmas since most of our families live either in San Diego or the Pacific Northwest. 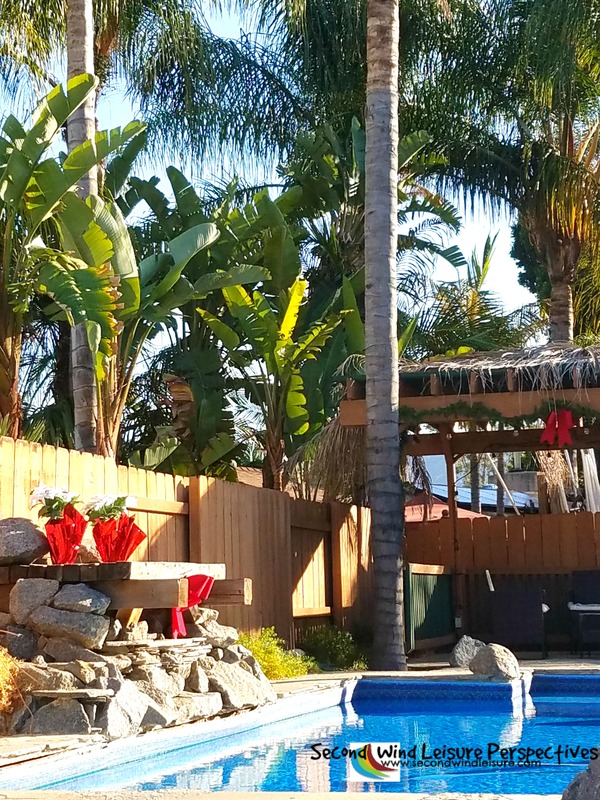 Spending the holidays in San Diego is never a problem for us because the weather is at least 10 degrees warmer than in Sacramento. It can be quite cool in San Diego, but during Christmas week, Southern California experienced a heat wave that broke many long-standing heat records. As I write this post after New Year’s the temperatures have dropped off significantly, but still no rain. I’m glad we are traveling to Hawaii from San Diego because we had to pack clothing and other things for a week in Hawaii. I broke out the shorts and tank tops for a few days as the heat wave continued. Boots and sweaters languished together in the closet, virtually unworn. We have come to love the month of January for the time we can both take off from work. Once the fall semester is over for me in mid-December, classes do not start up again until late January, giving me nearly 6 weeks of time off. Hubby works a lot of overtime between April and September and racks up comp time. With all the pools closed for the winter, he can usually take a few weeks off using up that time as paid vacation. No complaints here. Fri Dec 22 Our road trip south took 10.5 hours. We made good time the first 4 hours with little traffic. But we hit LA and lurched through stop and go traffic for 6 plus hours (and it was my turn to drive). We arrived at 4:30 unpacked our ridiculously over-packed car, changed clothes and headed for a family dinner at 6pm. But on the way there—we saw this in the sky!! 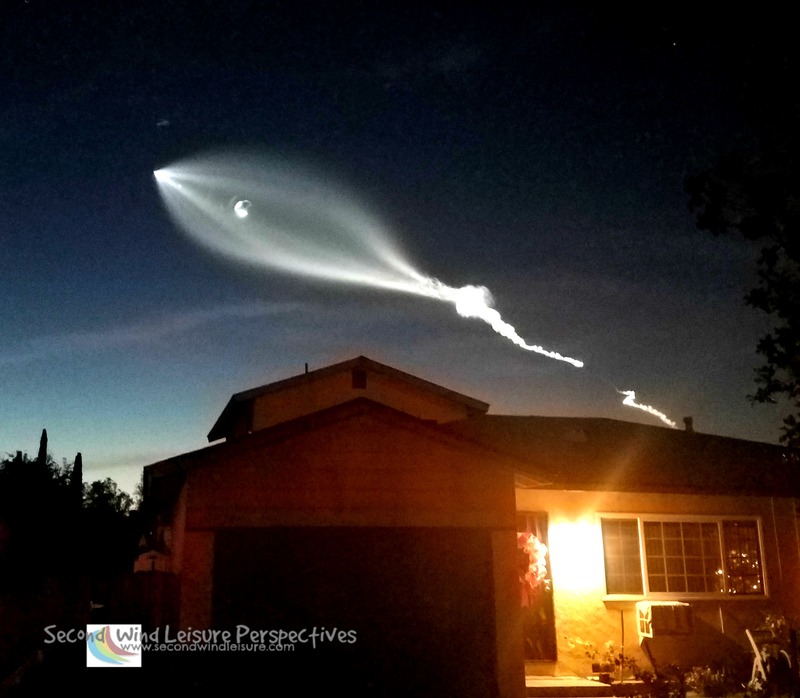 Space X launched 10 satellites from Vandenberg AFB in Palm Desert area of Southern California. I shared this photo on Instagram. I figured it was Santa taking a dry run to break in a couple of his new reindeer. Fri Dec 29 We drove out to the Indian casino and outlet stores for some retail therapy. Amazing to see so many RVs on the road east toward the mountain and desert areas for the coming holiday weekend. Sun Dec 31 We packed up and moved most of our stuff for the drive out to my brother’s house. A New Year’s tradition we enjoy is to spend the evening eating, sitting in our PJs and watching movies. Sad to see commercials for free car rides and towing services for revelers. We stayed “home” and loved it! My hubby and I are continually grateful that we have the funds to support a good vehicle to drive and take road trips. I love my Toyota with it’s v-6 engine, 4-wheel drive and other bells and whistles. Hubby will be buying a new truck in 2018, one that we can pull a new travel trailer with as soon as we can find a good used one. Our old trailer was fixed up and will be sold next month. Well, that was my December. Writing these daily sentences chronicling each day was easier than I thought… What was your highlight for the month of December? Please consider joining other bloggers for January’s “Sentence a Day” post. Start writing those sentences now! If you are up for this challenge, please visit Leslie at her Sentence a Day post. Way too busy Terri. Great descriptive photo essay though, and that photo of Space X is simply fabulous. REading this in December of 2018. Do hope this year will be allittle more calm. Happy Holidays to you, Terri. Hi JoHanna, thank you, that shot was so lucky, so amazing to see it! What a frantic time leading up to the holidays, Terri! Especially with your teaching job (grading), dog appointments and travel prep! Let alone, all the shopping, whether in person or online. But then, those relaxing days with family and nice weather arrive, and it seems all worth it! You might have seen us head east towards the desert on Friday, December 29th! We were one of those RVs going away for the weekend, but, luckily, we left early enough to beat traffic. We enjoyed a quiet night with Kathy and Thom on New Year’s Eve. It was nice to catch up with them, and with you and Janis during the holiday period! I hope you had an amazing time in Hawaii!!! Our December was a weird one. Not much in terms of productivity, shopping, or travel, but yet, it feels like it was a busy month that flew by. That was a busy month. I enjoyed reading your sentence a day post. It was well organised and I liked how you broke it into sections, Terri. At the end of November, our dog, Austin, also had the same operation as Brodie. He hated the cone of shame as well, but I found a blow-up collar on Amazon which did the trick just as well. He was far happier with it than the cone, especially because he wasn’t bumping into everything when he walked around. As for shopping after Christmas, I stick to online. I don’t tend to be very good with large crowds anymore. Plus the thought of queueing to ay at a cash desk is not appealing at all. 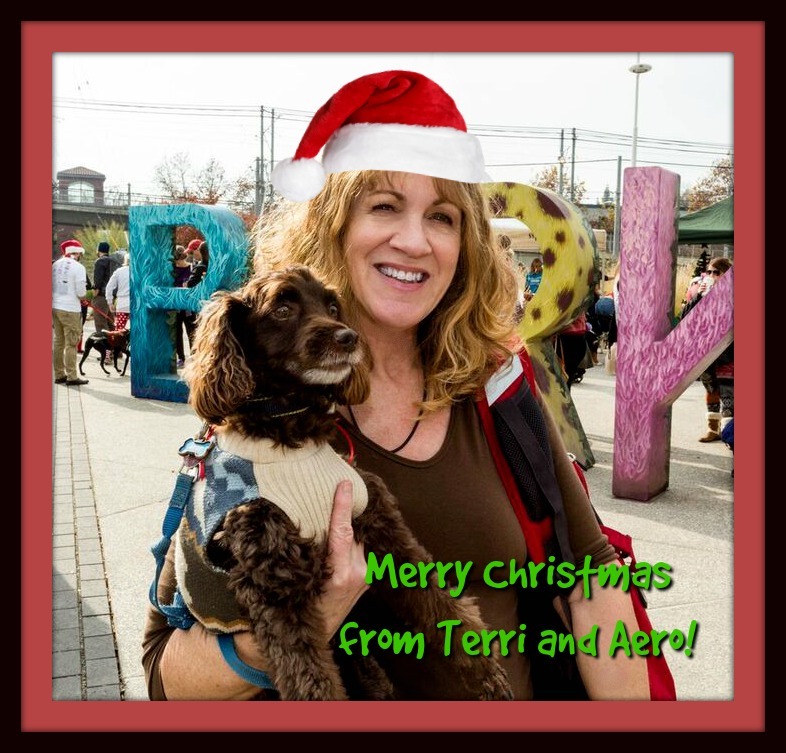 Thanks for sharing your festive month with us, Terri. I hope Hawaii was brilliant. I had a great Christmas too. Christmas Eve is the traditional celebration with my birth family, and their families. Then Christmas morning with my oldest daughter, and the grands, and my first husband. Sadly, my youngest daughter couldn’t make it down. But, it was still great! Hope you had a wonderful holiday, Melinda! Great idea to arrange your posts by theme. I do something similar but keep them in chronological order so sometimes finding a theme is difficult! We have been puppy-less for about five years, sure miss my pups. Over the holidays, it seems we are especially reminiscent of the days when they were so much a part of our lives. Driving home from Albuquerque to El Paso today, we saw some very unusual cloud formations, too. A la Area 51! I remember seeing your images on Instagram. We are not alone!! Thank you for the mention. Happy new year, sweets! We traded ends of California this Christmas season and, yes, Sacramento was at least 10 degrees colder than San Diego 🙂 . Good to be home now where it’s warmer. Have fun in Hawaii, where it’s warmer still! Sounds like you had an amazing holiday period, Terri. I felt a bit bad when I read about you feeling unwelcome in your family homes because of Brodie. My one sister recently acquired a puppy and I can’t let her bring it to my home because of Greg’s PTSD. Dogs upset him a great deal. It is tricky with dogs in other people’s homes. I feel good about boarding Brodie just down the street from my brother’s and he is keeping Aero. For the future I am looking into some house/pet sitting options. Thank you, Tina. I think this year my goals are going to blow with the wind a little! My parents travel with their dogs too and I love it! I wish our car had room to bring ours, but it’s full of kids! ha! Great post! Love your sentence a day idea! Hope you had a great birthday and a happy New Year! What a full and great birth month you had, Terri. There are a few December birthdays in the link up. Have a fabulous vacation in Hawaii and happy New Year! 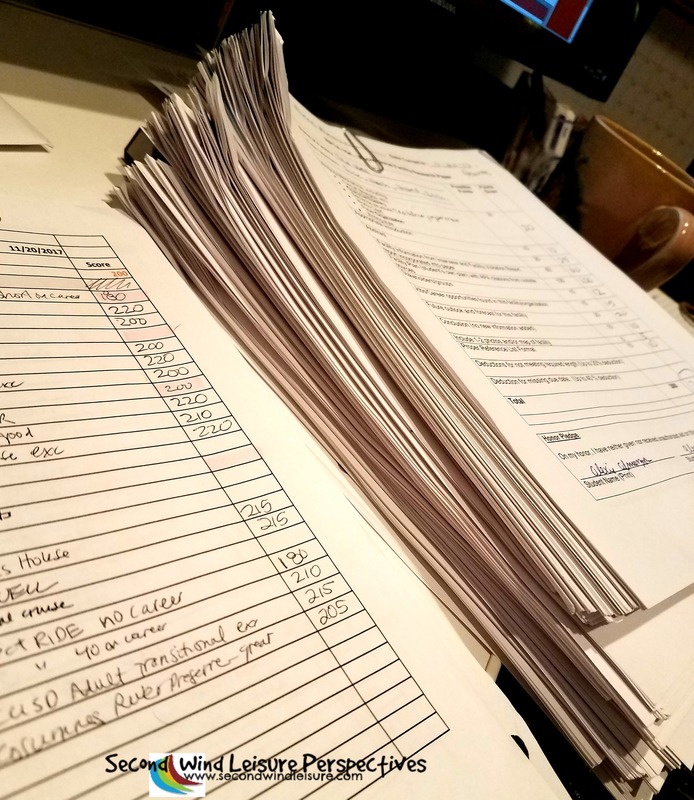 Hi, Terri – I love how you have organized this Sentence a Day post — it reads very well and is highly effective. Congratulations on a wonderful, and very full, birthday month. Wishing you a fabulous year ahead! What an eventful December! Good for you for having the dedication to write your sentence every day! I hope your dogs do well intheir temporary homes and that your trip to Hawaii is fantastic! You’re so busy, how do you find any time for leisure? Don’t know how your fur babies keep up with you. Whatever you’re doing, you certainly look more like 40 and you have the energy as well – you’re a walking broadcast for what you teach. You are too kind, Shari! I’m sure you are enjoying the gorgeous socal weather as I am. Flying out Sunday, can’t wait! My Instagram feed will be ridiculous! Happy birthday to another December woman, Terri! It’s always so nice to see how the month went for you!! I miss having a furbaby.